This was the look of my stats counter a few weeks ago after someone on StumbledUpon and rated one of my posts. It’s quite incredible to go from a few hundred hits a day to a few thousand. Beyond that, though, every time I would see this spike — the visual representation of a sudden and dramatic increase in activity — it felt like a metaphor for my emotional life. Between visiting my parents’ house, relationship stuff, and work politics drama, you may remember that I was pretty maxed out. Fortunately, I’ve come back down to earth. My psychic energy has been freed up and I am back to working on creative projects and relationship-building in my free time. 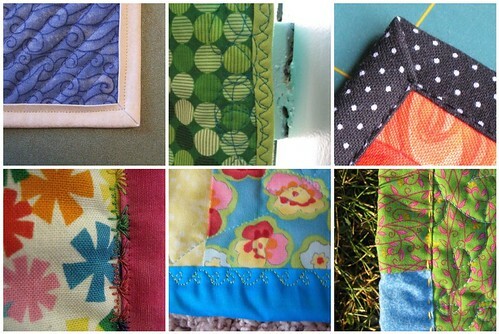 I was honored to be featured on WhipUp.net for my fabric folding tutorial. Hope people get mileage out of it! It definitely saved us at my mom’s house, and now I’ve folded all of the fabric that I “inherited” from her stash and put it into my own system. I guess it’s time for photos of my new studio work corner. Stay tuned. 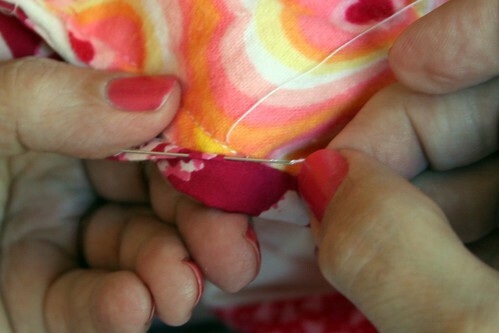 I also had a photo highlighted over on the Sew, Mama, Sew! blog. Thanks, ladies! I’m a long-time fan of the Mamas. Its been a while since we featured comments, but there have certainly been some great ones! Great reader contributions on my review of Mihaly Csziksentmihalyi’s book, Flow: The Psychology of Optimal Experience. Mal, Interesting commentary. I find that for me, being in the “zone” makes me a more relaxed and happier person. And that the creativity seems to unintensionally spill over into other areas of my life. And I absolutely agree that while sometimes creativity is spilling over (I call it having itchy fingers that just want to sew), other times I have to sit down and make myself sew and the next thing I know I’m there, (or in a place that leads me “there”). I’ve always found that the first step to “getting into the flow” is just DOING something. For me, it translates to a natural progression of ideas and work and then i DO forget all else. This also happens on the rare occasion that Greyman and i take off for a weekend—-when we are in the moment in the wild of the mountains, our separate ” lives” disappear except for the exact minutes we are there—we have even forgotten about our “babies” for awhile (the cats :}). I have done that at work also while arranging flowers! There is a very refreshing feeling to this when it happens and it happens often enough that i am taking great joy in my/our life for the first time in years. On the entry about organizing things in rainbow order, lots of fellow color-organization “freaks” came out to comment! Mr. BIV lives at my house, too, esp. in Fabric Land. I have warm colors (ROY) each in their own containers but all next to one another. I have cool colors (G. BIV) same situation. Then a container each for White/Cream, Beige/Tan, Gray/Black. A zipper bag of fabrics which can represent soil (White Sand to Black Clay). My “theme” fabrics are in their own containers: Food, Quilts of Valor (lots of donated fabric here; I don’t want to mingle it with my own), Reproduction (19th c. vs. 1930s), Holidays, Cats, Dogs, Bounty (harvest related), Tea/Coffee, Critters (mostly fish and birds, but some juvie lizard prints, too), Batiks, Hand Dyed, and Bright Multi-Colored What Color Is It Really? (one container). Probably missed a couple, but you get the idea…. I like the fruit color sorted, though I haven’t done it yet–it looks very cheerful! 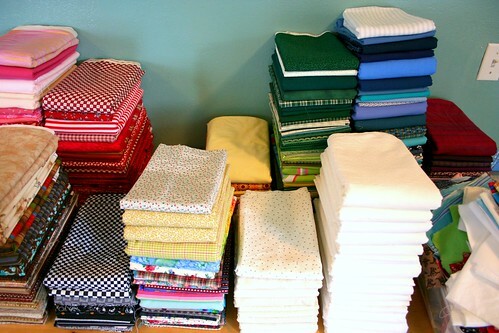 Interesting comments, too, when I shared about The Intervention —sorting through and purging my mom’s hoarded fabric stash. 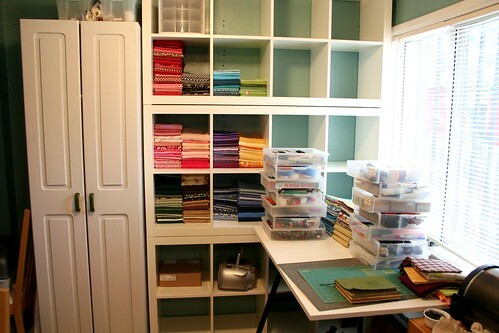 That’s inspiring- seeing all the pretty organized colors, purging, admitting there is a problem, but I can also imagine the daunting feeling hanging over something like that to even get started. I have the fabric I have because my aunt has brown boxes filling her garage. Luckily though, when I said I was taking a class and needed some- all my aunts opened their doors. 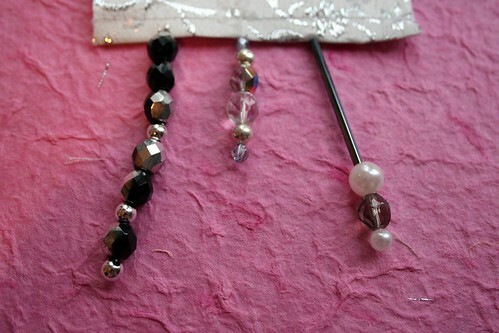 I’m working really hard on making things with what I have before accumulating anything more. I only buy something if I cannot in any way substitute something I already have. Thank you so much for the organization inspiration, congratulations on all the hard work you’ve accomplished so far and definitely sending positivity to you for the future goals. 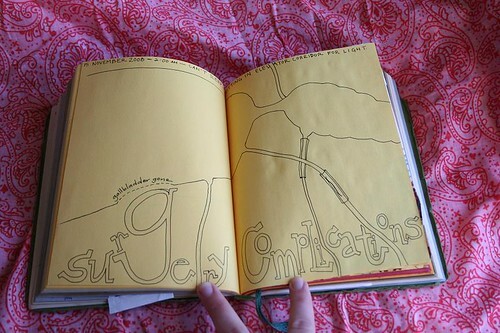 I declare my independence today from worrying about the future, it’s a waste of time. I declare my independence from procrastination! I’m taking care of some pesky details instead of letting them cause me to fret. I am declaring my independence from thinking I have to do everything without asking for any help. Finally, some good thoughts arose from my post about video games and creativity (constructive vs. destructive freetime pursuits). I absolutely believe there is something healing in using our creativity. About a year ago, I went through a bout of depression after losing my job (and the circumstances surrounding it). 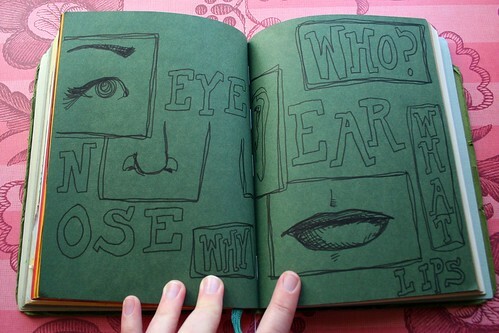 I did nothing but read, losing myself in imaginary worlds. I read 23 books in two weeks. I couldn’t focus, couldn’t sew, couldn’t make decisions. I finally realized that I had to make myself do something to break the cycle. 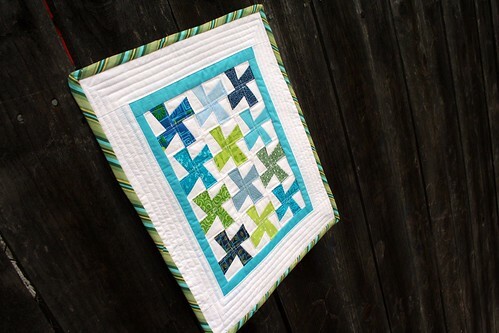 I chose to design and sew a complicated quilt block. I wanted to do something that required focus and attention to detail, but had no consequences if I failed. 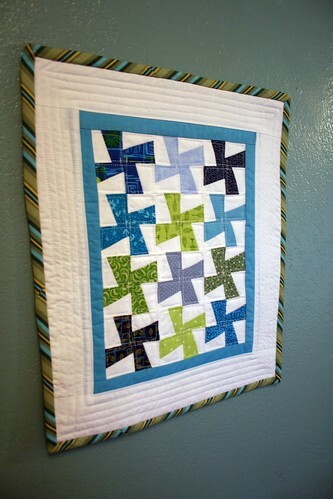 I credit that quilt block with starting me back to health. I named it Anxiety. Shortly after that I designed an entire quilt, followed by a couple more. I found a new job, and while things could be better, I also know they could be a LOT worse. I feel my best when I’m working – being creative in some form, even if it’s just figure out a software program at work. It’s when I stop sewing at home that I feel myself sinking again. So… gotta get sewing! I’m really behind on my blog rounds, but here are a few things I’ve been reading lately. 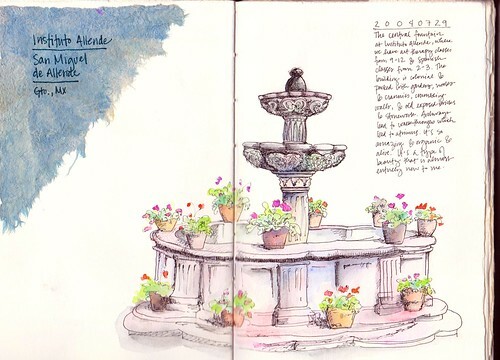 Beautiful artwork and thoughts on creativity from Gretchen Miller. Thoughts on being a “serious artist” from Robert Genn. SimpleMom‘s timely and inspirational post on The Clutter You Can’t See. I’m getting better at decluttering things/stuff/objects, but could probably benefit from a deeper cleansing. 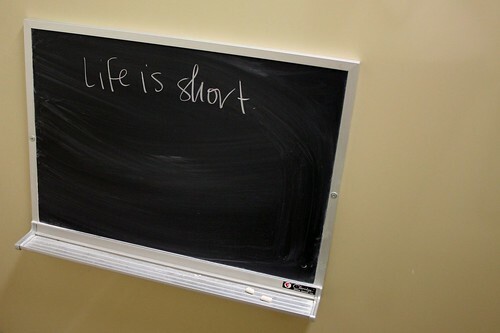 I’m passionately following Gretchen Rubin’s The Happiness Project. More later. I have just returned from my parents’ house where we touched, folded, sorted, and discarded thousands of pieces of fabric. Maybe tens of thousands? Hundreds of thousands? I don’t know. It was a lot. We are slowly working through my mother’s hoarded stash and trying to create a functional sewing room for her. I think we removed around 800 pounds of fabric from the house and we still have more to go. There are several patriotic-themed quilt stores near my mom’s house, and having easy access to cute red, white, and blue fabrics has driven her into the belief that she needs to be making patriotic quilts. I guess were all guilty of being influenced by marketing. I am a sucker for new drawing pens, myself. But, I don’t relate to the need for projects that are designed to be used only a few days a year. My apartment is too darn small to be storing Christmas quilts, Halloween wreaths, or any of a number of other holiday-related items. I only have room for things that I’ll be using year-round. 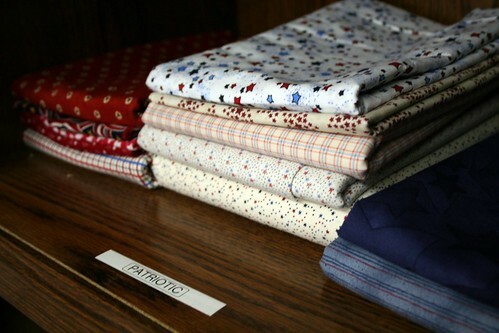 In that light, I am giving away some of my mom’s patriotic fabric stash. The giveaway may or may not include the fabrics shown above — I honestly can’t remember at what point in the process that photo was taken. We may have kept all of these, or discarded them all. Rest assured, the winner(s) of this giveaway will receive very cute American-patriotic themed fabrics. I just haven’t pulled them out of my car to snap a photo, yet. Leaving a comment on this entry telling us what you are declaring your independence from. This is the easiest way to win a point, so do it right now! Posting about this giveaway (and your declaration of independence) on your blog. Please post a comment on this post with a link to your blog entry. Declare your independence on twitter. Be sure to link back to this entry and include @turningturning so I can find you. Subscribing to receive turning*turning updates in your reader or by email. I’ll secretly declare my own independence in the feed for the next few days. Email me my declaration with the subject “Giveaway secret phrase” for another point. You don’t need to be a new subscriber — current subscribers can also earn this point in the same way. Once again, doing all 4 of the above steps will earn you a bonus point. Send me an email with the subject: “Giveaway bonus point” and you’ll receive your 5th point. Entries will close on Sunday, July 5th, when I go to bed. I’m very tired, so you better enter soon! Winners will be announced on Monday morning. Thanks for playing, and I hope you win. I’m so pleased that turning*turning.com was honored as a “Website to Watch” in the latest issue of Disco Underworld. I’m doubly honored that Stacey, DU’s editor and creative force, has offered to write a guest post for this site! Disco Underworld is a beautifully written and visually captivating magazine honoring the life and work of everyday people around the world. I finished re-reading one of my favorite books again, The Time Traveler’s Wife. I’m still stuck in the organizing/purging phase of my apartment overhaul, but I have carved out more space and time to be making things. I think we all love to ‘listen in’ on what others are doing and absorb little bits here and there. Sometimes it is with complete awe when the process or result is so different than any I have ever seen. Other times it is with a warm sense of the familiar and it is good to know someone else sees, thinks, or creates in a similar way. Haven’t started joining them together yet, so not sure about stitches showing or not. I think I don’t mind in this case. After doing a bunch of machine sewing, I’m glad for the change and wouldn’t mind the hand stitches showing. One great way to facilitate a good mind-body connection is to make artwork about your body — its ailments or its triumphs. Today I’m thinking more about ailments. I made a lot of art about my own body last year before, during, and after surgery. I even wrote about it here and here. As an art therapist who works in a hospital, I’m always interested in representations of physical, mental, and emotional pain. Frida Kahlo famously lived with pain caused by childhood polio and then a traumatic bus accident. Her art is generally labeled as Surreal, though I see it as a therapeutic reflection of reality. Frankly, with varying degrees of technical skill, this is the kind of art that shows up a lot in a hospital setting. The problems of pain and the foibles of the human body are, as we all know, very very real. Obviously, the human anatomy is a common theme in artwork of all kinds. Click the image above to find out more about the artists and their work. Becky Stern‘s anatomically-correct plush knee, based on her surgery. Becky also made an embroidered slice of her knee MRI. Dee Mallon made a journal quilt from a mammogram. Dee also points us to the artwork of Ann Merrell, who died of breast cancer in 1999. I think the connection to her illness is quite undeniable. 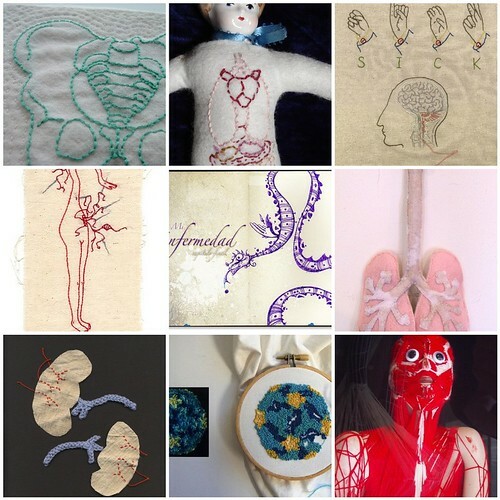 Dan Beckemeyer‘s breathtaking needlefelt/drawn anatomy project. Of course, actual physical representation is not necessary. One of my favorite flickr images is by karmapolis and is called “Mi enfermedad” (My Illness). It depicts a dragon, not a body or a brain. 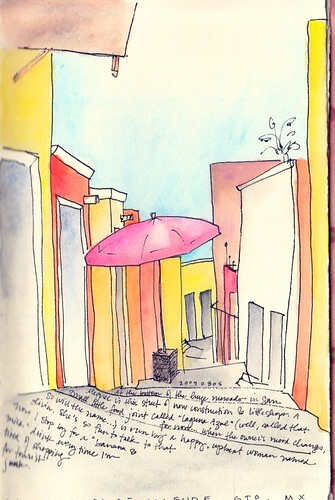 Other people may just use color, shapes, and lines to abstractly depict what they go through. What about you? 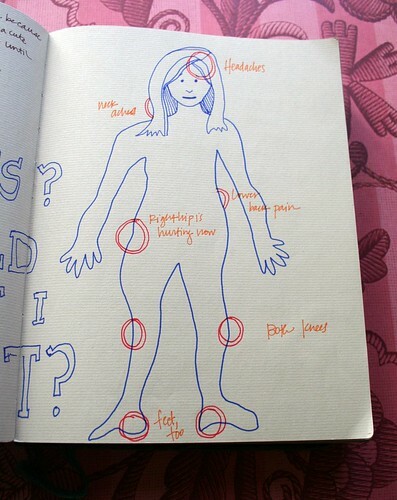 Have you ever made something about your body, an illness, or a physical ailment or triumph? Please share! Welcome to our latest installment of the Guest Post Series. 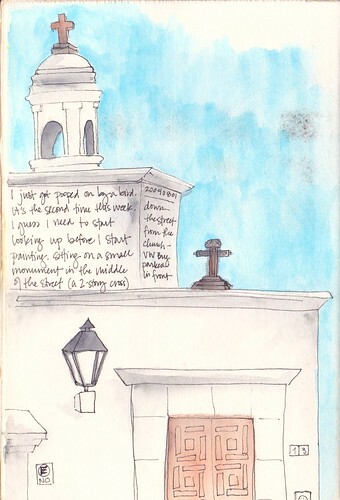 Holly chose to write about the creative process and some of its frustrations. There are some choice phrases in here that have stuck with me for weeks, so I’m pleased to present you with her words. In the meantime, if you’re interested in writing about your creative process, your emotional connection to your artwork, or thoughts about a specific project, please contact me! The creative process is powerful but it isn’t always wonderful. Sometimes it’s fraught with self-doubt and anxiety. I’ve been sitting here for hours staring at this blank page, why can’t I think of anything?? It always feels bad when you try to “force-create.” I’m sure you all know the feeling — staring at a blank page, willing the ideas and creativity to flow. Maybe there’s a birthday/anniversary/christening/special occasion coming up and you’ve promised to make something, but what? It has to be perfect, and no pressure, but you’ve only got a few days to make it so better get cracking. Gotta get those ideas flowing. Come on now, time’s running out. I don’t think there’s any way to avoid force-creating — we’re all going to come across it at some point — but how I like to deal with it is to get up and walk away for a while. Give it some space, come at it from a different angle. Often my best ideas come to me while I’m doing something completely unrelated. My actual creative process is usually very subconscious. It always starts with an idea. It starts foggy at first, like the phenomena of seeing something from the corner of your eye, but when you turn to look it’s not there. The idea creeps around the outside of my mind for a few days. I like to think of it as an incubation of sorts. I don’t interfere – I let it sit and incubate and grow and develop until it’s ready to reveal itself to me. Then comes that deep-in-your-stomach flutter of excitement as you think yes! Yes this is really great! Yes I can do something with this! Then it’s like a fever takes hold. A fever where eating seems irrelevant, where sleeping just slows you down, where your head is full of wonder and light and colours. Sometimes notes are made and sketches are drawn, sometimes I just roll up my sleeves and jump in. Often it’s messy. Often the casualties are grand. If you have ever seen someone trying to design a new plushie, you will know how big the pile of mutant discards can be. Club legs, misshapen heads, darts gone wrong. But sometimes it’s not until you put it all together and you stuff it and you look at it for a while that you realise… something’s just not right. You might not even know what doesn’t suit to begin with, but if something’s off you’ll have a nagging feeling in the back of your mind. Often I have to talk myself into fixing things, instead of continuing to work on a piece that I’m just not happy with, or letting it languish because I’m not happy. Admittedly, ashamedly, I do have a short attention span and a lot of my creative ideas fall prey to the thought that if I don’t do them now, they’ll slip back into the edges of my mind and get forgotten. But I do love the fever pitch of a new idea. It’s like the honeymoon phase of a relationship, all giddy and exciting. Other days… it’s not so great. My creativity comes in spits and spurts. Usually I feel my most creative when I have a lot of things I need to do, and suddenly my productivity increases – of course, not toward anything that actually needs to be done! I don’t try to start anything when I’m in one of my down periods, as I hate to force create. But I have a few projects I can pick up when I’m in a creative lull – like a cross stitch or some embroidery — just something small to occupy my hands until my brain fills up with ideas again. For me, creating is living. Creating is finding myself, validating myself, exploring myself, trying on different things for size. I am a plushie maker, I am a stamp carver, I am a quilter, I am an OCD sufferer with a penchant for organising my fabric in a rainbow fashion. I struggle with creativity, but I know, now, that I couldn’t live without it. Through creating I’ve learnt that not all criticism is bad. I’ve learnt patience and persistence, and I’ve watched myself grow. I’ve learnt to go slow, but not too slow – you’ve gotta keep working at being creative. I’ve learnt new techniques, I’ve met new friends, and I’ve learnt to respect myself again. I’ve learnt that not everything works out the way you want and you know what? Maybe that’s okay. Holly McGuire is a mild-mannered bus driver by day, bringing her love of craft to the people on the streets, one bus stop at a time. By night, however, she is a rogue crafter and lover of all things handmade. 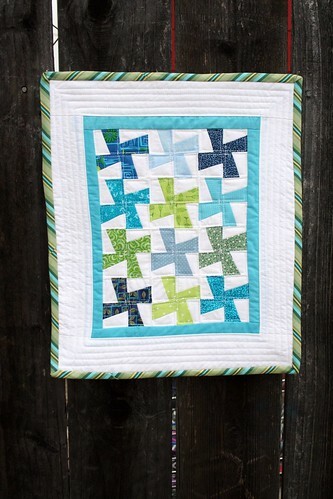 Too excitable to be tied down by one craft she dabbles in many – plushies, stamps, quilting, bag-making. 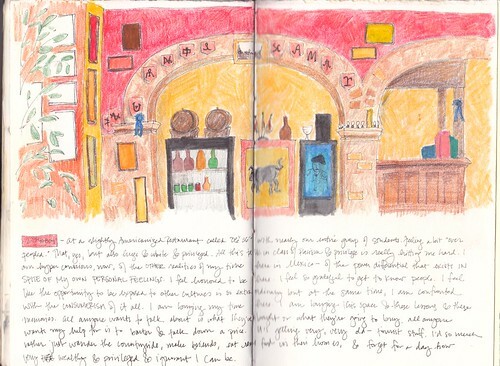 You can follow her creative adventures (and mishaps) over on her blog, Two Cheese Please. Thanks to all who entered the Granny Day Giveaway by choosing a color and associating it with an emotion. Winners are listed below. But first, I thought I’d play along too. 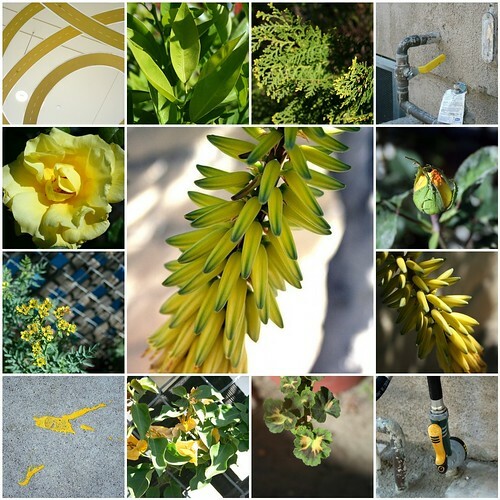 At some point in the last week, my emotional color was yellow — not a nice, warm, orangey-yellow, but a lighter, green-like yellow. These photos were mostly taken around my apartment on Saturday morning. Unlike many who commented about yellow, I don’t always associate the color with sunshine and cheery mood. 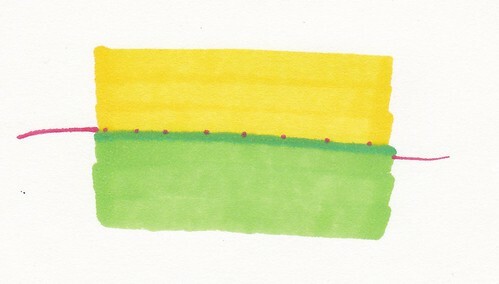 This dank, green-ish yellow is more of a desperate color for me — something tight and trapped, something stuck. I don’t know why. Guess its been a weird week. 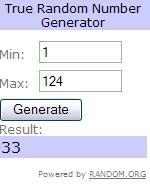 At any rate, without further ado, here are the winners of the Granny Day Giveaway. Yup — I said winners plural. Because this is the first giveaway, I thought “aw, heck.” Let’s get crazy. Honorable mentions to Dionne, Margi, Liz, and Elizabeth who went the extra mile and earned the bonus point. As a final point of interest, here is a list of the selected colors in order of popularity. Interesting trends! I had a great time with this fun giveaway and it really brought out the lurkers! My feed reader is now bursting at the seams with new blogs that I never would have discovered otherwise. I highly recommend you pop back to the original entry and check out the commenters. Visit a few blogs you’ve never heard of before. Expand your circle and start leaving comments. Let’s get interacting! I know I am looking forward to interacting with you all more. Please don’t forget — this is just the first of many giveaways I’ve got planned, so you’ll all be able to enter again! I recommend subscribing to this blog so that you don’t miss anything good. 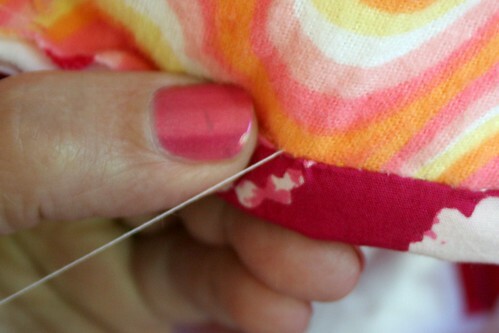 Update: Apparently this stitch is called the Ladder Stitch. Personally, I prefer my title for it: Invisible Mamma-Jamma Stitch. 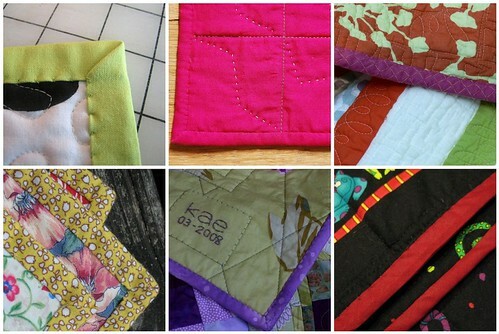 While ladder stitch is common to embroidery, applique, and closing up stuffed plush dolls, apparently very few people have applied it to quilt binding. Let me know if you try it! 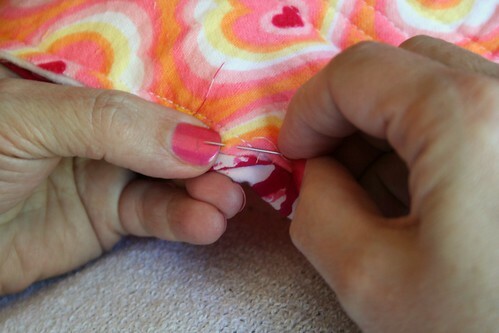 I mentioned before that my mom had taught me a stitch for quilt binding that was so simple and obvious yet so wonderful that I wanted to share it with you. 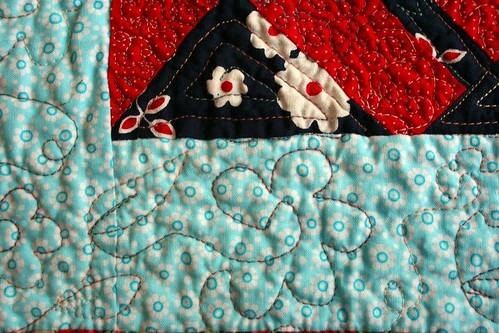 The photo above shows the back of my rough draft quilt. 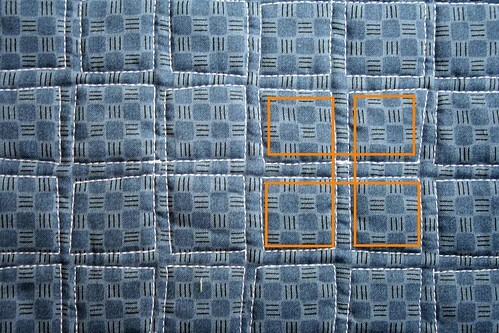 Following the many tutorials and demonstrations online, I whip-stitched the binding to the back of the quilt. 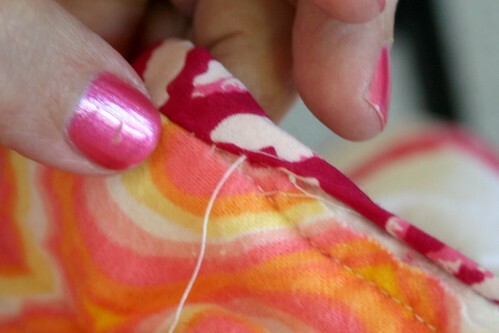 But, as you can see in my photo and the ones above, whip-stitching can leave a very visible line of tiny stitches. In addition to being sort of unsightly, I worried a bit about the stitches getting caught and, God forbid, ripped. Some people go to great (and creative!) 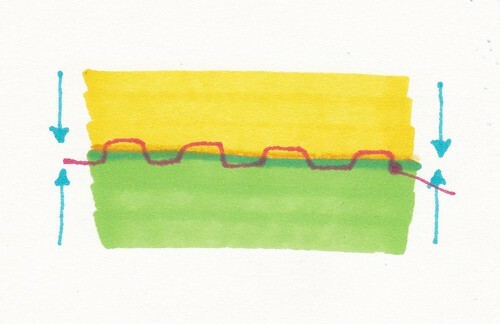 lengths to machine stitch their binding, as seen above. I imagine that at least some of them are frustrated (as I was) with the result of the whip-stitching and looking for alternatives. 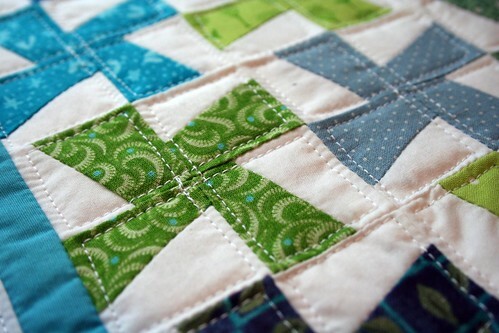 When it came time to bind my friend’s baby quilt, I whip stitched the entire thing and hated it. On the phone with my mom (sewing consultant extraordinaire), she said there was a better way and that if I would be willing to re-do it, she would teach me. It only took me 3 evenings to unpick all that stitching, and 3 weeks for her to arrive in town with thread and scissors in hand. 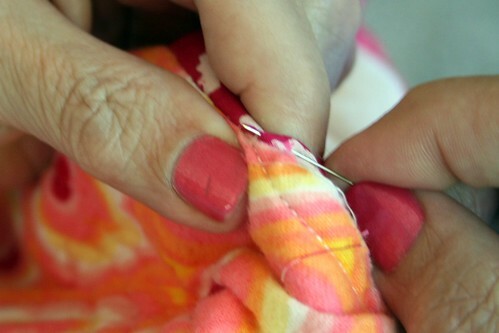 Mom proceeded to teach me the ladder stitch — a stitch that is easy, fast, and nearly invisible! 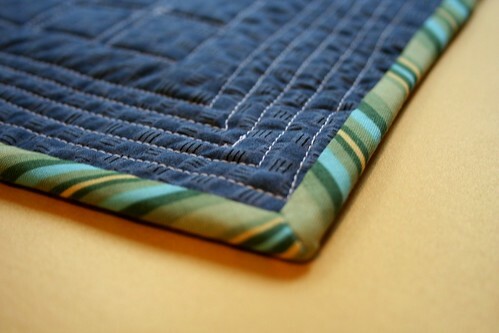 She uses it for both quilt binding and hand applique. 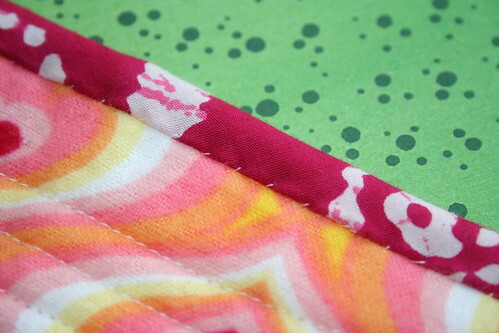 I think it would work for any application requiring joining of two fabrics where at least one of them involves a fold. 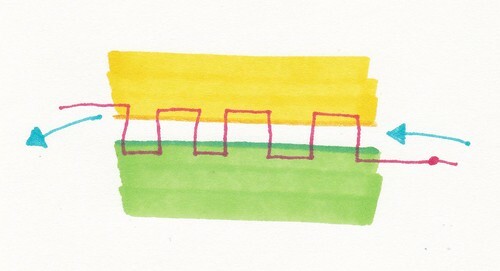 The basic idea is to think of the shape of a castle wall. So that all that’s left visible on the outside of the fabrics is a tiny dot of thread where the needle has passed from one side to the other. In my experience, you have to really hunt if you want to see that thread. Awesome. After my brother’s wedding, I took some action shots of my mom teaching the stitch. Hopefully you’ll find it useful! Start off with the Mamma Jamma knot I already taught you. 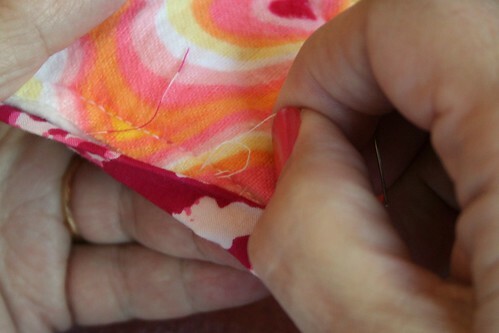 Then, insert the needle on the back side of the binding to hide the knot. Only go through one layer of the binding, as the goal here is invisibility, man. 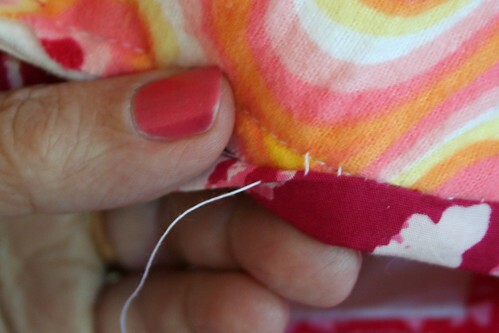 When the needle comes out, it should be between the two layers of binding fabric and smack dab in the middle of the crease of the binding’s fold. If you felt like popping the knot through the fabric to bury it, nestling it right into the inside of the binding’s fold, you can do that. 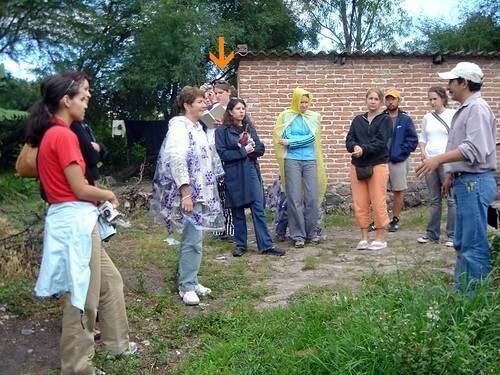 My mom didn’t do that, though — you can see the knot poking out on the right if you look at the image below. 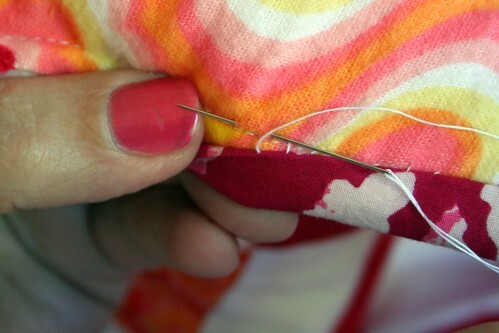 Make sure the exit point is directly parallel from where you want to insert your needle into the quilt. Check the diagram above — you shouldn’t have too much diagonal or angled anything while working this stitch. In this case, mom started about a quarter of an inch from the previous stitches, since that’s about how far she spaces this stitch. For my part, I space them a little closer. Then stitch down straight across from that exit point. 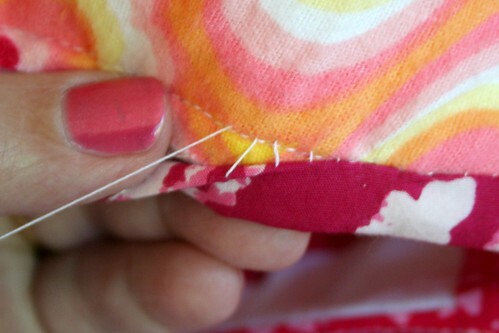 Make your stitch just above (on the quilt side, not the edge side) of your line of basting stitches. 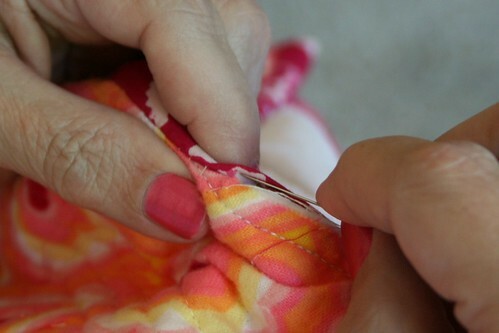 Come back into the binding fabric directly across from the previous exit point. 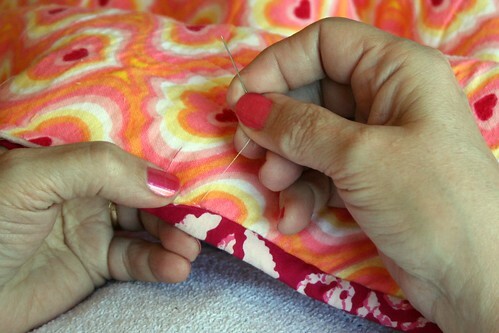 You want to stitch right in the fold of the binding, because the thread will ultimately nestle there, perfectly parallel to the fold. 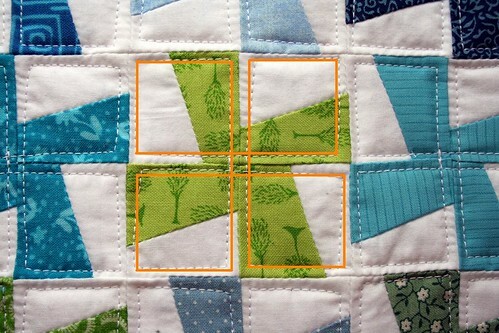 Alternate stitches between the quilt and the binding, always inserting your needle directly across from your previous exit point. Again, refer to the diagram above if you have questions. When you’ve done a few stitches, gently tighten up the thread. As you do, the stitches will disappear and the whole thing will be held together by thread which is tucked neatly out of sight, buried inside your work. 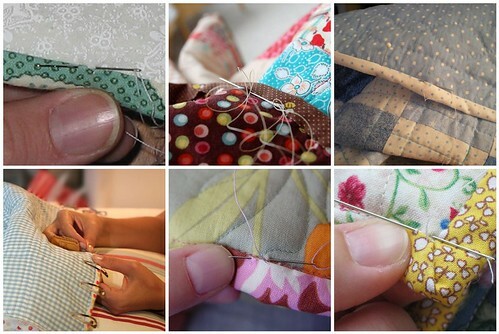 Be careful, though, not to tighten too much — if the quilt stretches more than your stitches, your stitches will break and your binding will come undone. And voila! The stitches are now only visible if you go looking for them. Continue along this way until you reach the end of your thread. 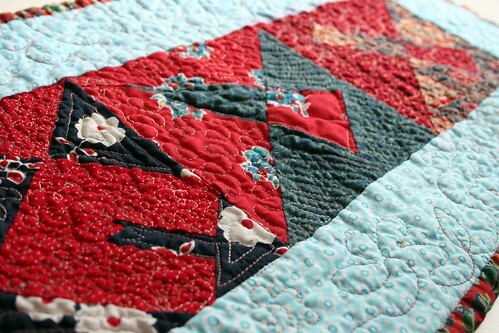 To finish off, take a couple of stitches in the quilt, between the basting stitches and the raw edge. Mom likes to finish hers off by bringing the end of the thread through the loop before tightening the last back stitch to secure it. And there you have it! If you try this stitch, if something doesn’t make sense and you need more/better explanation, or if you dispute the name of this stitch, please leave it in the comments! With the Granny Day Giveaway going on, I’m thinking about color this week. Yeah, that’s me. Under the orange arrow. Note that I am the only person not paying rapt attention to the speaker, and instead am sketching the cactus to my right. I remember it was bursting with small fruits and I couldn’t NOT capture their deep burgundy-gold-ness. 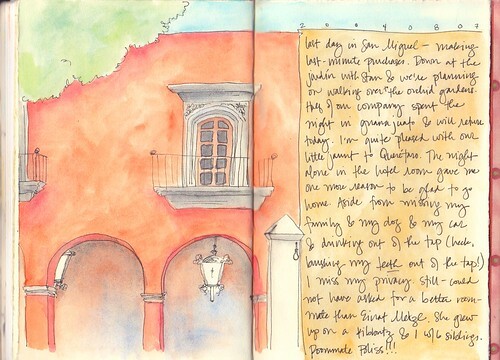 The photo was taken by a friend who sent it to me with a note: “This is what you looked like the whole time in Mexico, FYI.” I think she was a little annoyed, but my sketchbooks from that trip are their own reward. 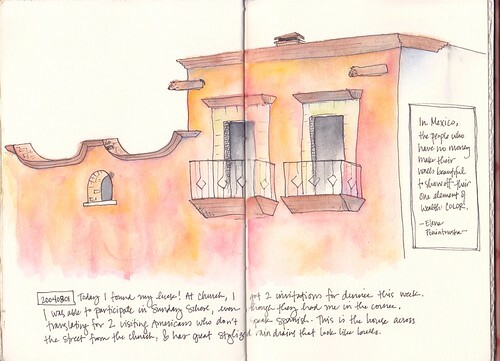 In Mexico, the people who have no money make their walls beautiful to show off their one element of wealth: COLOR. There’s still time to enter the Granny Day Giveaway. Just think of your current favorite color and an emotion you associate with it. There are 5 ways to enter! This is the second in a series of guest posts written by creative types about their creative process, their experience with art and healing, and their emotional connection to artwork. If you’re interested in contributing, please contact me! When Julie explained her reasons for not wanting to capitalize words and sentences in her guest entry, I agreed wholeheartedly and left Julie’s original grammar choices intact. at the end of 2007, i left my job. it was a hectic, fast-paced, cut-throat, high-powered, career-track kind of job that i had, for a long time, really loved. in a way, leaving a job like that is like a divorce. you loved it once, deeply and completely, and were blind to its faults. but slowly, over time, without really noticing, you fell out of love with it. although you may be happy that you’ve gone — especially if it was your decision — that doesn’t really make it any easier. i worked at the headquarters of a multinational firm that was the largest in its field and by far the most significant company in my country of residence. it was a very traditional company in a very traditional, conservative, very masculine kind of business, so i had to be extra tough to get along there as a woman. and while i loved that in many ways, i found that i couldn’t shed the constraints it had given me overnight. when i look back, i realize that it took nearly a year to be free of them. i spent the best part of 2008 getting back in touch with a creative side that had become subsumed under the crushing wheels of the career and the company. such a conservative, traditional business demands certain frames and constraints on the kind of creative thinking i had been accustomed to. it’s not that there was no creative thinking, it just wasn’t the kind that allows a person to stand before a canvas and freely paint. i tried to rush my recovery. i immediately signed up for a painting class which ended up a source of frustration to me because i was completely blocked by nearly four years on the fast track. i had been so (re)defined by the expectations of that conservative man’s world that as i stood before the canvas with paint and brush in hand, i felt cramped and unable to break free. i found it difficult to even know where to begin. one of the reasons i had felt out of touch with my creativity in my job was that i was simply too busy. when i finally got home at the end of a day at the office (or after my nearly 200 days of travel a year), i was too exhausted to sew or draw or paint or do anything creative. throughout college, i had always had all kinds of projects going on — sewing, painting, decorating, cooking — but i didn’t have time for any of that while at my job. the entire notion of dragging everything out, doing the project and then putting it all away again before i had to go back to work on monday morning was simply overwhelming and it shut down any impulse i might have had to do it. what i came to realize as i struggled to reawaken my dormant creativity (because i never believed it was gone, just that it was in hiding), was that what i craved was a space in which to be creative — somewhere to leave works in progress without them being in anyone’s way (in other words, not our dining room table). somewhere i could retreat and think. somewhere with an atmosphere conducive to creativity. where my muses would be comfortable and happy and venture forth once again. somewhere i could be alone or create together with my daughter. so i put a lot of thought into what that space would be like. it would be separate from the house, it would have plenty of light and be very open to take advantage of any summer there might be (it can be quite rainy in denmark in the summer), but very cozy when the rainy grey days inevitably would come. it would be inviting yet private. there would be room to have several projects of different kinds going at once. all of my supplies/stash would be at hand on shelves and in drawers. it would be ok if paint got on the floor. it would have wi-fi and a stereo. there would be room for books and items of inspiration. there would be plenty of space for kids to work alongside adults. it would be ok to make a big mess. there would be a wood-burning stove for heat and coziness. it would be a space where everyone wanted to hang out and make something and there would be plenty of inspiring supplies at hand when inspiration struck. even before i left the hectic job, we were already discussing my dreams for the space with our architect. and thankfully, over last summer, the space unfolded before me. it has four sets of double doors that open wide for those summery days. it has a cozy wood-burning stove for those days when it rains and is so grey and chilly you think the sun will never shine again. the supplies are there. the books are there. the walls are a rich turquoise and the ceiling is a darker, deeper teal. it is both cave-like and light, warm and cool. it is all of the dichotomies rolled together into one fantastic vortex of creativity. there are snips of fabric and bits of paper on the floor. the sewing machine stands out at the ready at all times. there are projects in various stages of completion on the coffee table and the sideboard. the drawers are filled to bursting with pretty paper and fabrics. music spills forth from the ipod. there are inspiration books on the shelf, beckoning to be taken down when one feels like drawing or quilting or making clay figures. paints and pencils and canvases beckon. embroidery threads, rolls of felt and rubber stamps whisper ideas. it is a good, healing space where my muses have been set free. they are still walking on tippy toes, but they get stronger all the time. perhaps virginia woolf was right; one does need a room of one’s own.